Eggs Benedict was one of my favorite breakfast/brunch foods but now that I am no longer eating meat I am just as satisfied with eggs florentine. And as far as I’m concerned there is only one way to make them and that is with English muffins, Thomas’ English muffins, they are crispy and crunchy and just the right size for the poached eggs. And don’t let poaching eggs intimidate you, it’s actually pretty easy. The trick with something like this is keeping everything hot so that when you put it together and serve it that it is still hot. I like to put the English muffins in the toaster, ready to go. I put the pot of water on for poaching the eggs and then I make the hollandaise sauce. 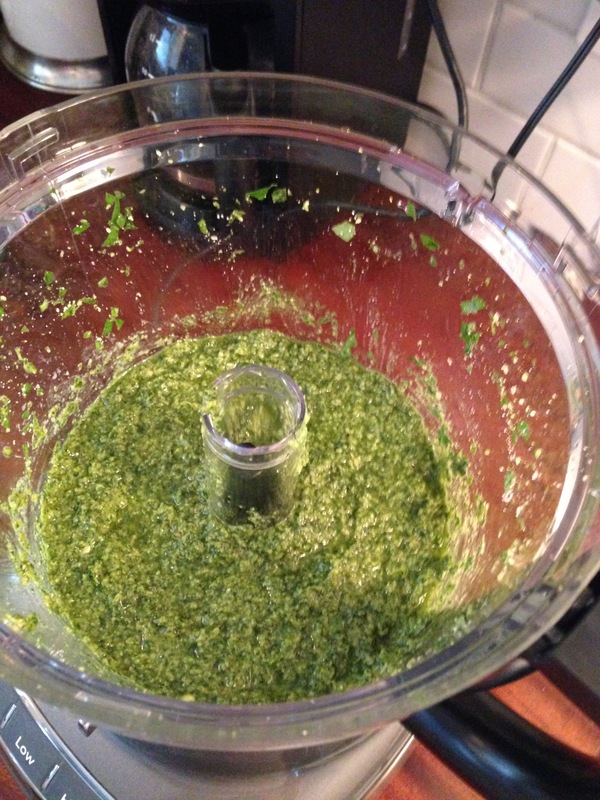 Once the sauce is made I sauté the spinach and turn on the water for the eggs. Once the eggs are in, start the toaster with the English muffins. And viola when the eggs are done you put it all together and it’s nice and hot! Melt the butter in a small saucepan. Do not let it boil or burn. In a separate bowl, beat the egg yolks. And the lemon juice, heavy cream and salt and pepper. Add the melted butter a little at time and stir well. Repeat until all the butter is added making sure you don’t add it too quickly or the egg yolk will cook. Once all the butter is added, place the mixture back into the saucepan. Cook on low heat, stirring constantly for about 30 t0 60 seconds. Remove from heat and set aside. I keep mine on the stove, just not on direct heat to keep it hot. 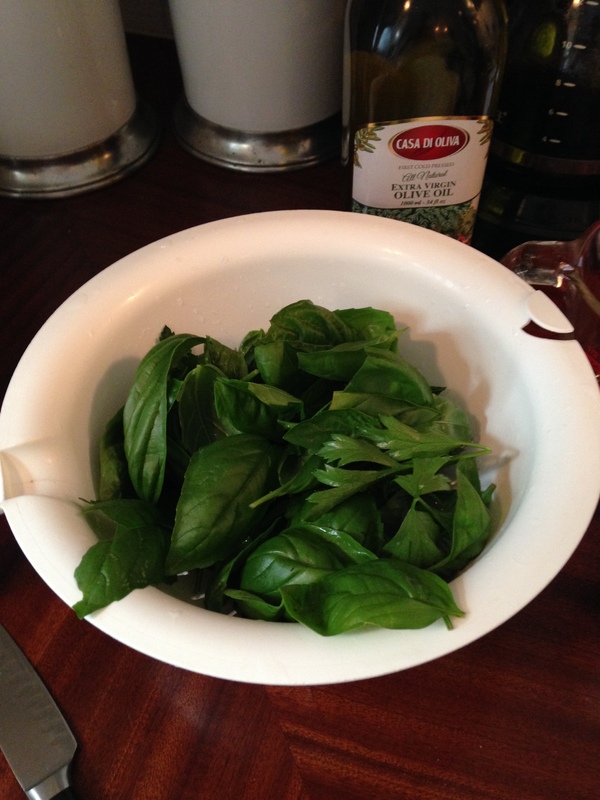 In a small saute pan add about a tsp of vegetable oil and heat, add spinach and saute until wilted. Turn off heat and keep warm. Fill a medium size saucepan half way. Bring the water to a boil and just as it starts to boil to turn the heat down so it is just a nice, slow boil. Add a tsp of vinegar. Crack an egg into a small bowl or dish. Slowly pour the egg into the hot water. The time of cooking depends on how well you like your eggs cooked. I like about 3 minutes so the yolk is nice and runny. A white foam may form on top of the water, you can scoop that off, it is normal. I do all 4 eggs at the once, adding them slowly one at a time. Turn on the toaster and toast until desired. Plate the toasted English muffin, top with tomato slice and wilted spinach. When eggs are done cooking, remove from water with slotted spoon and place on top of the spinach. Top each egg with hollandaise sauce and enjoy! *As with most recipes you can adjust to your taste, I don’t like tomatoes but my husband does so I just put the spinach on mine. I have also made them with hash browns instead of English muffins. 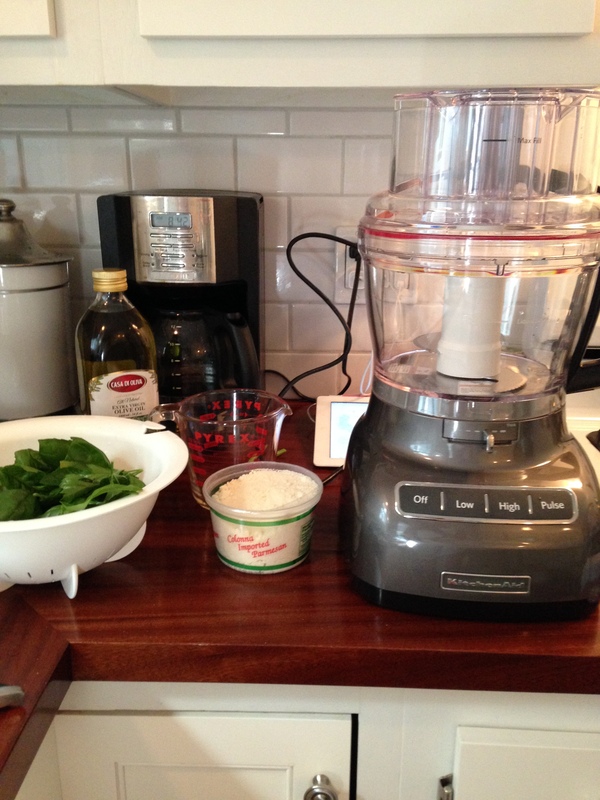 You can use asparagus instead of spinach…the options are limitless! This summer we had our first garden and it was amazing! So much fun to see the plants grow and produce and then you get to eat it! I am a huge lover of Italian food, so to be able to make sauce with tomatoes and herbs from my own garden was incredibly rewarding. This post will be in 2 parts, this post is the recipe for the homemade sauce and the following post will be for the eggplant rollatini that I made with the sauce. Now this is truly my recipe so the measurements are not exact, use your best judgement when adding the spices and herbs and adjust to your taste. Bring to a boil a large pot of water. Cut out the core of the tomatoes, and mark an “X” on the bottom. 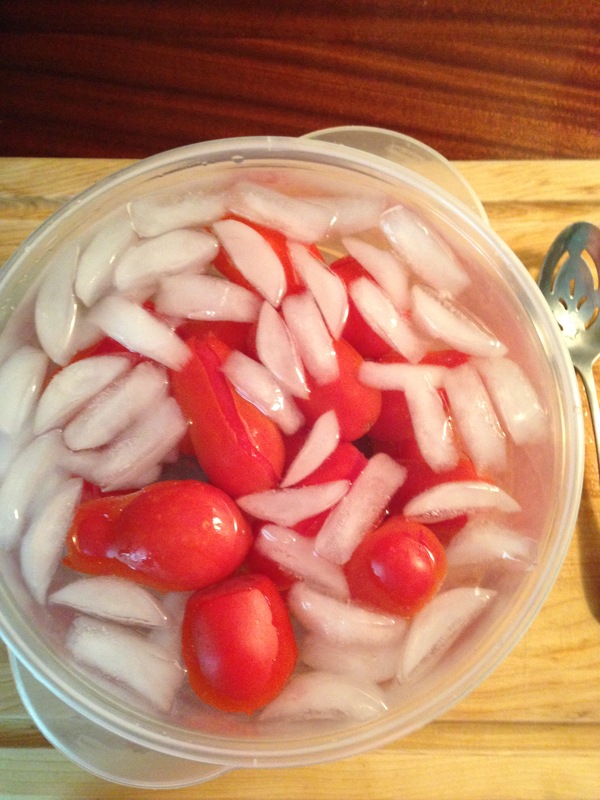 Have a large bowl of ice water ready to put the tomatoes in after they go into the boiling water. 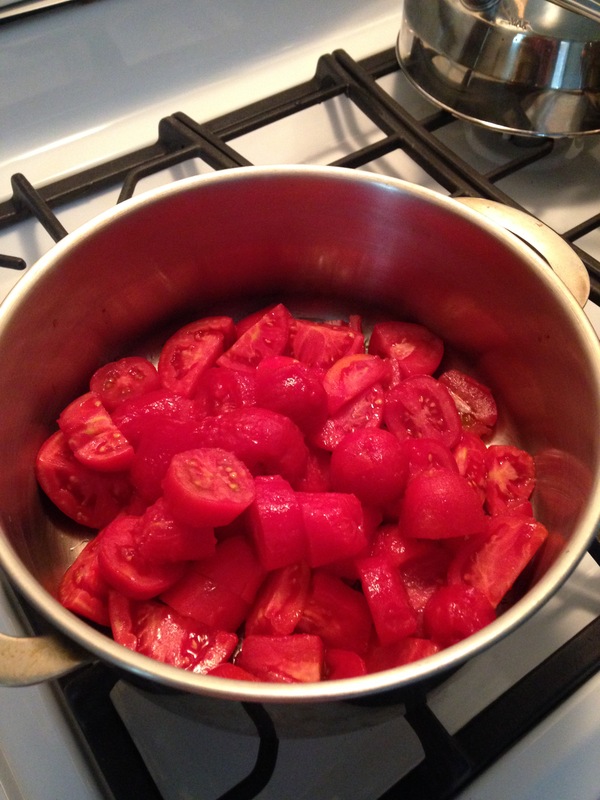 Once the water is boiling place the tomatoes into the boiling water for no more than 60 seconds, then using a slotted spoon put them into the ice water. The skin will come off no problem, just don’t let them sit in the ice water too long or they get soggy. Once they are all peeled, cut into quarters and set aside in a bowl. Dice half of a large onion and saute in 2 Tbls of olive oil in a large pot over medium heat until soft. Add 3 cloves minced, fresh garlic and cook till fragrant. 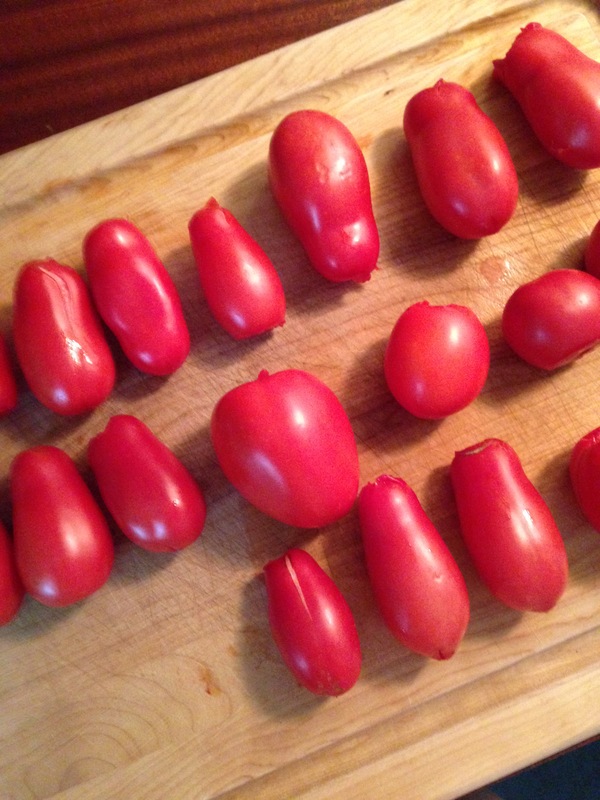 Add tomatoes and cook over medium heat using a wooden spoon to break the tomatoes into smaller pieces as they cook. 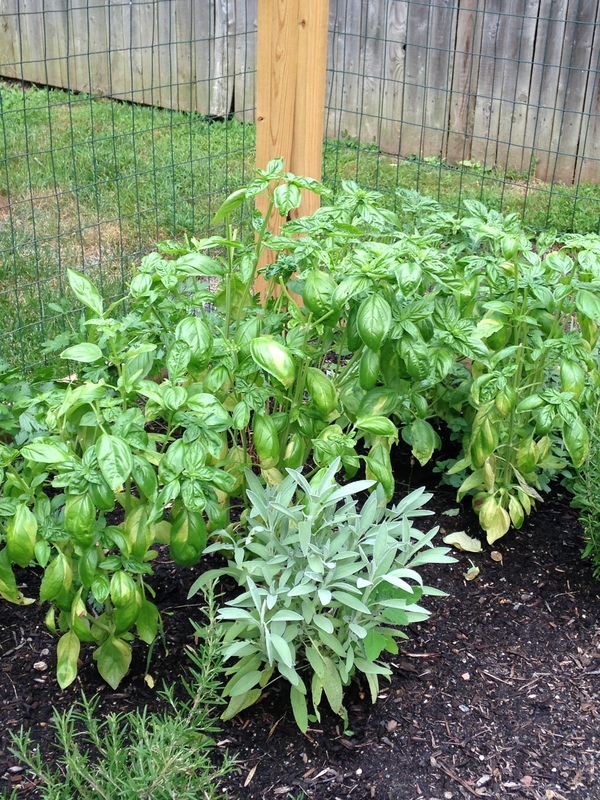 Once they really start to cook down add salt and pepper, fresh thyme, oregano, basil and parsley. I used them straight from our garden, just rinsed and chopped; started with a little bit of each and added more as the sauce cooked until I liked the flavor. Simmer on low for about another hour and half. I cooked my sauce for about 2 hours total. It was absolutely delicious. I ended up making it about 3 times this summer, we had lots of tomatoes. We grew heirloom and beefsteak but it looked like we ended with some plum too, I used all 3 in the sauce. If you prefer a thicker richer sauce you can add tomato paste and if you like a little kick you can add some red pepper flakes…no rules in the kitchen, just make sure it tastes good!